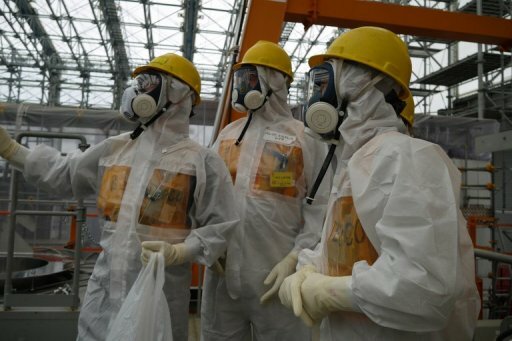 Workers inspect the Fukushima Dai-ichi nuclear power plant on September 12, 2013, in a photo taken by Tokyo Electric Power Co (TEPCO). Japanese Prime Minister Shinzo Abe Thursday ordered the operator of the crippled Fukushima nuclear plant to work out a schedule for stemming radioactive water leaks as he toured the facility. FUKUSHIMA DAIICHI NUCLEAR PLANT, Japan (AFP) – (AFP) – Japanese Prime Minister Shinzo Abe Thursday ordered the operator of the crippled Fukushima nuclear plant to work out a schedule for stemming radioactive water leaks as he toured the facility. Tokyo Electric Power (TEPCO) had “to resolve the leaky water problem by setting a timeline”, Abe told journalists travelling with him. Abe said TEPCO chief Naomi Hirose told him the utility would secure by the end of fiscal 2014 (March 2015) another one trillion yen ($10 billion) in addition to the one trillion yen that it had already earmarked for urgently needed safety measures. Abe was at Fukushima Daiichi power plant less than two weeks after he told the International Olympic Committee that the situation there was “under control”. The remark, delivered as part of Tokyo’s successful bid to host the 2020 Summer Games, sparked criticism at home at a time TEPCO was palpably struggling to control the flow of mildly contaminated groundwater and was encountering problems with highly radioactive waste water making its way into the sea. TEPCO has poured thousands of tonnes of water on the Fukushima reactors to tame meltdowns sparked by the March 2011 earthquake and tsunami. The utility says the reactors are now stable but need to be kept cool to prevent them running out of control again. Much of that now-contaminated water is being stored in temporary tanks at the plant and TEPCO has so far revealed no clear plan for it. Abe stressed — as he did before Olympic chiefs — that the toxic water was contained within a small bay attached to the wrecked power plant. “One of the main purposes of this visit was to see it for myself, after I made those remarks on how the contaminated water has been handled,” Abe said. He said he would “work hard to counter rumours questioning the safety of the Fukushima plant”. Abe said he also urged TEPCO to demolish two reactors at the plant that escaped tsunami damage. TEPCO officials said they would make their decision over Abe’s suggestion by the end of the year.